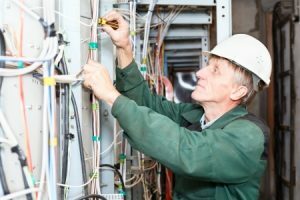 “Can I afford to postpone upgrading wiring in an older house?” It’s a question you might find yourself asking once you realize the job will need to get done at some point. Delaying can seem like an attractive option once you take the size of this kind of project into account. However, as is the case with most electrical repairs and upgrades, the sooner it’s done the better. If your home has an older electrical system, you could be putting more of a load on it than the wiring can support. The reasoning behind this is simple: we use more power nowadays than ever before. When your older home’s electrical components were new, there was a much smaller amount of appliances and devices in the household. With homeowners using more and more new technology, with higher electricity demands to go along with it, outdated wiring needs an upgrade as soon as possible. If you’re wondering what to focus on or if there’s anything, in particular, to expect when upgrading wiring in an older house, read on. How Can I Be Sure My House Needs a Wiring Upgrade? In the beginning, the electrician you hire will assess your electrical system to confirm whether it can handle your current needs. If he or she finds that the wiring falls short of the task, an upgrade (for wiring or the panel) would be the next step. If you’ve contacted a reputable expert for the job of upgrading wiring in an older house, you likely have more options at your disposal than you might expect. For starters, if you have an older building, you might want to keep certain features intact. It might be necessary to pay extra to protect the structural assets you want to retain, but taking this preventative measure up front can end up saving you a great deal on restorative work later. Receptacles and light fixtures may also need upgrades. Since the wiring is getting an update anyway, you can keep your plans in mind as the new installation’s details come into focus. For example, if you want to have an entertainment room, with more outlets for the various devices, this can be part of the job (along with the essentials of the upgrade, of course). Improved safety measures will also take effect when upgrading wiring in an older house. The electrician will install GCFI outlets in moisture-prone places that were likely unsafe for years. To reduce tripped circuits in the future, ask about wiring straight from an outlet to the breaker so that no other appliances will be on it. This is ideal for receptacles for items with high power demands, like air conditioners. You may not think anything is wrong with your system, but you could still be at risk for dangerous complications with outdated wiring. Knob and tube wiring, which utilizes ceramic knobs and tubes for running the wires, is no longer legal for new constructions in the United States. This is because it comes with an increased chance of electrical fire. Unfortunately, this type of wiring is much more common in older buildings. To identify whether you have a situation like this, or for guidance and reliable service as the install takes place, go to the professionals. Upgrading wiring in an older house can be a monumental task. At Bryan Electric we have experience in every type of electrical job, no matter the size. We strive to ensure the work is safe and economical, all while meeting the needs of our customers. We’ll keep you involved and in the loop throughout the work, and you can always feel free to bring us any questions you may have. To learn more about upgrading wiring in an older house, or to schedule an appointment, give us a call at (770)680-2144 today.